The Kenya Medical Practitioners and Dentists Union (KMPDU) wants the deal Kenya has with Cuba terminated following the death of Dr Hamisi Ali Juma from Mombasa County. In a statement on Monday, KMPDU Secretary General said Dr Juma was found dead on Sunday in his hostel room in Havana. He had been on a Kenyan government sponsorship for family medicine studies. Dr Oluga said the programme should be closed immediately as "it has proven not beneficial to the doctors". "The arrangement has left Kenyan doctors vulnerable, frustrated and in deplorable conditions. 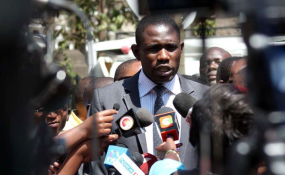 This follows failure by the Kenyan government to secure proper housing, pay promised allowances and allow the doctors to reconnect with their families," he said. Dr Oluga noted that Dr Juma had expressed desire to end his studies for these reasons. "The doctors have constantly expressed their frustrations with the manner in which the government has withheld or completely failed to pay their living expenses in a foreign country. Further, the Kenyan embassy exhibits high-handedness when concerns are raised," he added. The secretary-general further complained that their Cuban counterparts "receive the royal treatment with chauffeured transport, lavish living, and triple the pay of Kenyan specialists funded by taxpayer money". Thuranira Kaugiria, who is the KMPDU Secretary-General for Nairobi, earlier said the doctors are paid Sh36,000 and that they had wanted the amount increased to Sh44,000. The Health ministry earlier reported that Dr Juma died by suicide and said his body will have been flown to Kenya by Tuesday. "The circumstances surrounding his death are still not clear and we are still waiting on information from the embassy and the authorities," he said, as quoted by the Business Daily. "The ministry has taken necessary action and informed the family, the county authorities and the governor after verification of the information." A medic in the programme said Dr Juma was to travel on Tuesday to check on his wife and eight-month-old son as they had been ill. The union recommended that the sponsorship be provided though the five local Kenyan universities offering family medicine. They include Moi University and University of Nairobi. He condoled with Dr Juma's family, saying, "We note with regret the devastation that the incident has left the immediate family and the 49 Kenyan doctors under similar sponsorship." Kenya sent 50 doctors to Cuba as part of an exchange programme aimed at improving services provided locally. In May 2018, Health Principal Secretary Peter Tum noted the government's commitment to making health care accessible to all and said this was the reason for the importation of 100 Cuban doctors. He explained that in that country, most doctors work round-the-clock and that many developing countries were seeking support from it because of its superlative healthcare.